Here we go! 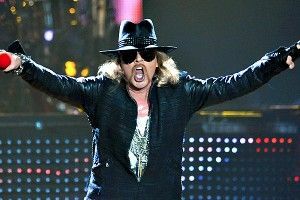 Wednesday Axl Rose released an open letter explaining that he flatly rejects the Rock and Roll Hall of Fame’s inclusion of himself, as a member of Guns N’ Roses, into the Hall class of 2012. Well, this is awesome. Ever since the fall, when the shortlist of nominees for this year’s Rock and Roll Hall of Fame nominations were announced, Grantland has been hoping against hope that Guns N’ Roses’ inclusion would mean that just this one year — just this one time — the Rock Hall would be as unpredictable and entertaining as the music it purports to celebrate. And now here we are, a few short months later, and we’ve gotten snipes and host screwups and dramatic rejections. It’s all really happening. This is the kind of thing that makes you feel pretty grateful about how much Axl hates the rest of original GNR. So Axl’s pissed the Hall thought they’d be able to convince him to play music with Slash again, just for one night. A bit unreasonable, perhaps, but they seem to have struck a nerve. (And like, come on, it’s Axl Rose.) And now he gets to reject the Rock Hall, which is way more badass than being inducted into it, anyway. Really, it’s a win-win: Axl gives us an entertaining blowout in which he continues to expertly burnish his rep; Slash and the other guys get to accept their award at the ceremony without Axl there being all passive-aggressive about passing the salt at the dinner beforehand; and nobody that has not consciously made the decision to check out DJ Ashba and Bumblefoot has to check out DJ Ashba and Bumblefoot. By the way, considering the recent Lana Del Rey situation, this much is clear: Axl is on one right now. Under the circumstances I feel we’ve been polite, courteous, and open to an amicable solution in our efforts to work something out. Taking into consideration the history of Guns N’ Roses, those who plan to attend along with those the Hall for reasons of their own, have chosen to include in “our” induction (that for the record are decisions I don’t agree with, support or feel the Hall has any right to make), and how (albeit no easy task) those involved with the Hall have handled things … no offense meant to anyone but the Hall Of Fame Induction Ceremony doesn’t appear to be somewhere I’m actually wanted or respected.